SantaMonica you get my vote for innovative, out of the box thinking! I've run into the scrubber phenom about two weeks ago and have dived into everything I can get my hands on. I've gotten thru 18 pages of interesting material on the Tom Barr site. Clearly Tom is not a fan of scrubbers with freshwater planted tanks. But before I give up on the idea of adding a scrubber to my system (for a planned large planted freshwater set up), I want to be sure I'm not throwing the baby out with the waste water. So I am hopefully going to be able to learn a great deal here on your site. I haven't yet found a "Freshwater" forum so if there is one here, please let me know. Here's my planned setup. I'll have a 700 total gallon set up composed of two tanks, one a 450 gal tank and the other tank divided down the middle with a display on the front side and a sump behind the middle partition. I have 480 nylon scrubbies plus foam to use in the sump. The two tanks will share the same water and be essentially the same system. Now the sump will have the diminsions of roughly 7 ft x 18" x 25". I had been planning to use baffles to direct the water flow up and down thru the scrubbies. The tanks will sit in a perpendicular fashion, an "L" shape. Both tanks will be made to looks like one "L" shaped tank built into a wall. I'm planning to draw water from the large tank into the sump. The display tank in front of the sump will get a measured amount of water flow and will be heavily planted and house nano species such as shrimp, Celestial Danios, cardinal tetras etc. The large tank will be about 12 ft x 36" x 25" and house angels, harls, and dwarf cichlids. It will be moderately planted but have substantial open areas in the front of the tank. My biological filtration potential will be massive. I can use all or some of the 7 ft x 18" x 25" and pack it full of first mechanical, then bio filtration. I can use a substantial part to grow emergent plants or even heavily plant fast growers in some areas. In other words, I'll have the space to do different things and really get er done. What I think will get done is excellent removal of ammonia, nitrites and solid waste. What I'll be left with is nitrates. Big regular water changes could become prohibitive due to the massive volumes we're talking about. A 20% water change a week will be 140 gals. 1. If I added an algae scrubber to the substantial biological filtration, would it be more of a help than a hurt? I'm looking here to allow me to reduce water changes by removing most of the nitrates. 2. Would the scrubber complicate my desire to keep the nurtrients for the plants up to an optimal level? Phosphate for instance. 3. Would I be able to alter flow over the scrubber screens (in response to more algae in the display >> increase the flow, to respond to starving plants >> less flow? In other words, if my plants seemed to be starving, I could back off the flow >> removing less ferts and micros from the water >> making more available to the plants. Of course I could add ferts and chemicals to either the tank water to feed plants or directly onto the scrubber if necessary. 4. Tom Barr advocated using emergent plants and heavy planting to keep the nitrates low >> algae down. Regarding nitrates, would the extra plants be superior to algae in removing nitrate? 5. In a large system with massive bio filtration available, would I need to have the 4x tank volume / hr flow thru the bio filtration? How would this change if I do add the scrubber? I realize that this is a complex set of questions but I am hopeful to learn a great deal from you. Glad you like all the info. 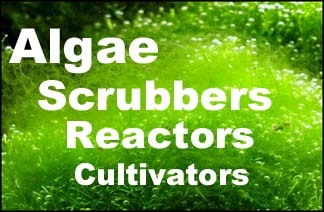 Several people do use scrubbers with FW plants, simply because their plants alone are not keeping nuisance algae away. Plants and algae operate the same way, except that algae divides and grows faster ("doublings per day"), and can therefore use more light and flow to extract nutrients faster from the water. And a scrubber is designed to offer this higher light and flow. But I think a planted tank, if done properly, would not need a scrubber. I've not done a planted tank yet myself, so I'm just going by what I read. One of the tricks, which Barr might have had to deal with, is if your scrubber is too strong it will slow your plant growth. This can be controlled by reducing the number of hours that the bulbs are on, but it still would need to be experimented with. You would not want to vary the flow, however. If large variations in filtering were needed, you should have two separate units, so that you could shut one down entirely if needed, flow and all. Due to the fact that plants absorb nutrients too, you probably don't need a large scrubber. Only supplementary. If your goal is to reduce waterchanges, then you should be able to eliminate them altogether, as you can with SW.
Flow through the scrubber is only determined by the length of the pipe: 35 gph per inch of slot. You're an electrical engineer? Congrats. I have a son who is a mechanical engeeer so I'm partial to you tech/science-savy guys. Your comments are helpful. I do have a related question regarding turning the water over thru a bio filter 4 to 5 X an hour. I can see that if there was a limited amount of filter medium. My system would have a massive amount of bio filtration however. Would it make sense to cut the circulation in half due to the large availability of bio filtration surface area? If I added a small scrubber as you suggested, and varied the light, dependent on the algae in the display tank, why would it not make sense to dose the water with ferts (even a little in excess if I erred at all), to insure the algae wasn't removing stuff from the plants? Would the algae in the scrubber not pull the excess phosphate from the water after the plants had their fill? My goal would be to reduce water changes due to the very limited accumulated nitrates. EE by schooling only. Work has been all promotion, marketing, and sales. With scrubbers, the "throughput" flow is not really important. The algae will only grow so fast. The only flow that's important is the flow that keeps the screen wet: It must be rapid and constant. The one exception would be when you feed a reef tank lots of liquid food; this puts lots of nutrients into the water quickly, and as soon as the nutrients touch cyano, the cyano will grab the nitrogen it needs, even before the water ever had a chance to get to the scrubber. In these cases you do want extremely high turnover from the display to the scrubber, so that as soon as liquid food is put in the water, it is sent through the scrubber. Matter of fact, putting the liquid food in right before the scrubber is best; the scrubber will remove the nutrients and let the food particles flow right through. As for dosing or not, your water either has enough nutrients for your plants, or it doesn't. If you are feeding more nutrients than your plants need, then the scrubber will remove the rest. If you are feeding less nutrients than your plants need, then the scrubber will be competing with the plants for them, and the plants will probably lose. There will be a balance point, but you'd have to experiment to find it. One could argue that it could be just as good to add more plants, instead of a scrubber. Thanks a heap SM. Would you offer an opinion regarding the flow rate thru the entire bio filtration. The common recommendation as you know is tank volume 4 to 5 x /hr for adequate filtration. In my case wi massive bioavailability due to all of the nylon scrubbies (480) plus foam, would it make sense to slow the water turnover rate to say twice the tank volume? Thanks again for your labor of love here. I know a contractor who might be interested in making scrubbers. Any thoughts on marketing? I actually don't know much about bio material flow-through, so I'd go with whatever are the standard methods are. However it seems odd that you need so much (or any) bio surfaces to convert ammonia to nitrate, since the plants (and scrubbers) consume ammonia as their primary food source. I just set up a cart at www.santa-monica.cc for the 100, and am building some test units of the 25. Thanks for the offer... if it gets to that level then maybe I'll talk to your guy. SCRUBBER should be run (illuminated) at night only 8 hrs..
during the day -the algae will be taking in o2 and exhaling c02 - thus feeding the plants..
at night the opposite would happen with the plants....feeding the algae.. If you get the balance right- an equilibrium might be achieved..
Am I making sense? what do you guys think ? You can try it. You are basically moving nutrients from one algae group to another.